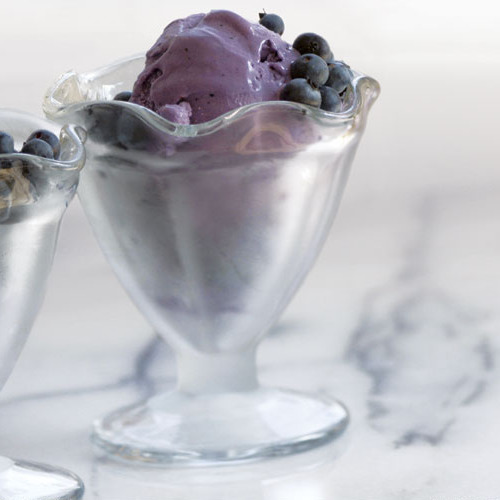 Our favorite models churn out creamy, smooth results that put store-bought ice cream to shame. Ice cream makers have come a long way since those loud, leaky buckets you may have hand-cranked on your grandmother’s porch. They needed a barrel of ice, multiple scoops of rock salt, and many-a-cousins’ elbow grease to produce tasty results. Traditional models like those still exist (and may have their charms), but we prefer the ease and convenience of modern electric canister and freezer models that do the churning for you. They’re well worth the investment, though both types have their advantages and disadvantages, depending on the amount of space, time, and money you have. We tested 12 models to determine our favorites and found that the two here were a cut above the rest. Although designed differently, canister and freezer ice cream makers work essentially the same way. You turn on the machine and then pour in a homemade base (usually made from cream, milk, sugar, eggs, and a flavoring for ice cream or sweetened fruit juice or purée for sorbet). A churning blade (called a dasher) slowly mixes the base as the cold bowl inside the machine freezes it to a smooth, soft-serve consistency. These come with a liquid-coolant-lined bowl that must be frozen before making ice cream; freezing the bowl can take anywhere from 4 to 12 hours. 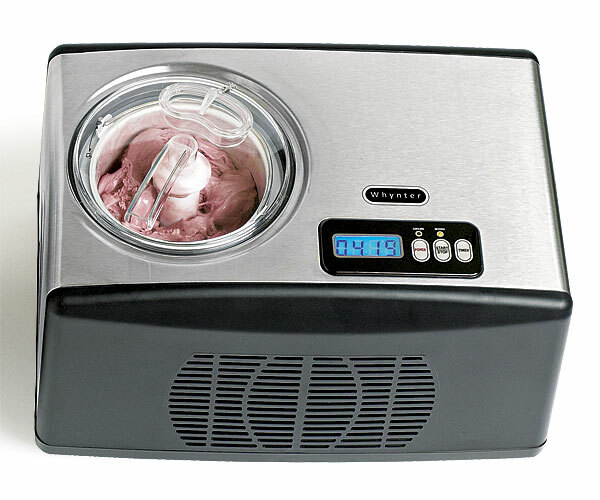 Canister ice cream makers are fairly inexpensive and generally churn ice cream faster than any other machines on the market; the ones we tested all produced soft-serve results in no more than 20 minutes. A 1-1/2-quart model (the average size we tried) has a bowl that’s about 5 inches high and 7 inches wide. If you have the freezer space to accommodate a bowl this big, as well as the patience to wait for it to freeze, a canister machine is a relatively low-cost, easy way to make delicious ice cream and sorbet. 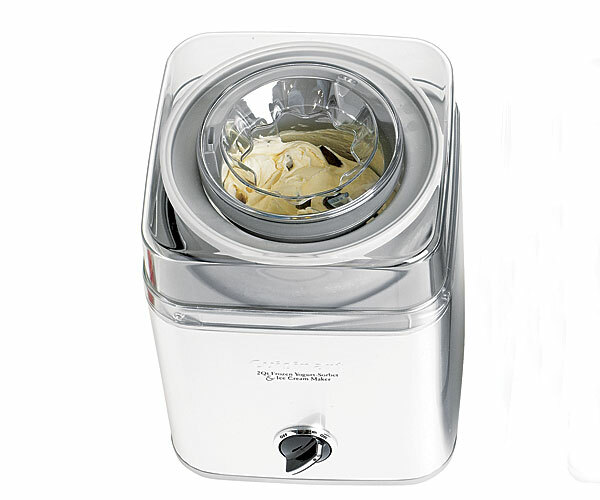 This was the fastest canister model we tested: Its bowl was frozen and ready to go in just four hours, and it churned rich, smooth ice cream in only 12 minutes (sorbet took 21). The churning blade did a nice job scraping the sides of the bowl; in other models, this wasn’t the case, and ice cream froze solid on the sides. This 2-quart machine has an 8-1/2-inch-square footprint and a bowl that’s about 1 inch larger than those of other models we tested (though it doesn’t noticeably take up more freezer space). This machine is easy to assemble, has a see-through top, and the widest opening (3 inches) of any model in its category, which makes adding ingredients (and sneaking a taste) easy. It has a basic churning blade, a simple on-off dial, and a sleek, rounded metal base that’s a cinch to clean. What’s more, it’s super quiet. It comes with a three-year warranty. These models have an integrated freezer, so you don’t have to start with a frozen bowl. Turn on the machine, add your base, and you’ll have creamy ice cream in about a half-hour. That convenience comes at a price, though—anywhere from $279 to more than $700. For those with a sweet tooth, the high cost will be worth it. Without a bowl that needs hours of freezer time, these models can run continuously, making batch after batch. True, they can be bulky and, in some cases, quite heavy, but there’s no better option for making ice cream on a whim. This freezer model offers the most bang for your buck. Not only was it the cheapest freezer model we tested, but it also had some of the fastest churning times, producing ice cream in 30 minutes and sorbet in a mere 24. The 1.6-quart machine is large (it has a 15×10-inch base) and weighs 22 pounds, but that’s nothing when compared with a 37-pound pricier model. Its digital display keeps track of time remaining (which is helpful) and the temperature inside the freezer (though unnecessary, it’s still fun to monitor). The portal on the lid is small, but if you remove the entire lid to pour in the ice cream base and add mix-ins (the motor continues to run), the machine has a generous 5-inch opening. Ice cream and sorbet came out luxuriously smooth, with a stiff soft-serve consistency. The machine has an uncomplicated churning blade, a smooth, stainless-steel and sturdy plastic exterior, and an interior bowl that can be removed for easy cleaning. When in use, it emits a low hum that’s easy to ignore. It has a one-year warranty. Footprint If you’re thinking about buying a canister model, make sure you have room in the freezer for the bowl. If opting for a freezer model, allow for plenty of countertop and storage space. Generous openings A wide opening makes pouring in the ice cream base, adding mix-ins, and stealing a quick taste that much easier. Look for an ice cream maker with an opening of at least 3 inches. Yield A pint-size maker is great for two people; a 1.5- to 2-quart machine is perfect for a small family. If you plan to make ice cream for large crowds, opt for a 4-quart model. Simplicity The simplest models are often the easiest to use and clean. Look for models with a basic on-off switch, a simply designed churning blade, and a smooth exterior. We tested 12 electric ice cream makers by making lemon sorbet, vanilla ice cream, and ice cream with chopped Skor candy bars. For each machine, we noted assembly and prep time, churning time, ease of use and cleanup, and the taste and texture of the final product. 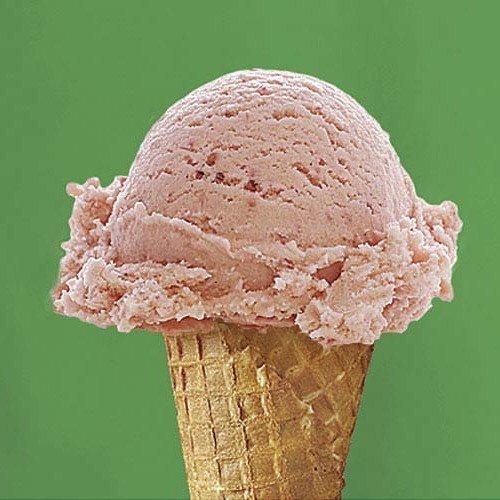 Try out our ice cream maker recipe builder!